Lifetime passes to America’s national parks for senior citizens and Americans with disabilities are now available through the mail. If you qualify, don't miss out on the best bargain you'll ever encounter. Our national parks rival any destinations in the world for natural beauty, historic importance, and outdoor activities. The admonition to "See America First" is still a good guiding principle for people of all ages who love to travel, explore, and discover the richness of our country. National Park Service Director Jonathan B. Jarvis said the Senior Pass and the Access Pass will still be available at national parks, but the option of receiving a pass by mail may better suit some people “Any change that makes it more convenient to come to the parks is a change for the better,” Jarvis says. 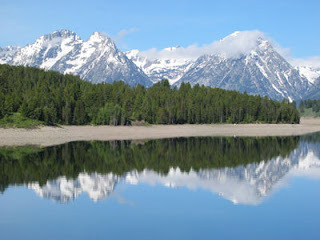 "National parks are places to share with children, grandchildren, and other family members. They facilitate recreation and healthy living. Many parks, including Yellowstone, Shenandoah, and Denali, have trails that are accessible to people with limited mobility and to wheelchair users. We also have many accessible camping and picnic areas," Jarvis adds. 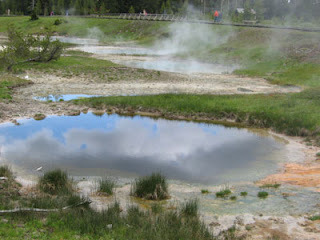 Steam rises from hot springs in Yellowstone National Park. Senior passes are available for $10.00 to citizens age 62 or older. Access passes are free for people who have permanent disabilities regardless of age. Both provide admission to, and use of, federal recreation sites that charge entrance or standard amenity fees. Pass users also receive a 50% discount on some amenity fees for activities like camping and launching a boat. There is a $10 processing fee to receive a pass by mail. You can print out an application for either pass at http://store.usgs.gov/pass/index.html. Once the application package is received and the documentation verified, the pass will be mailed to you. For more information, visit http://www.nps.gov/fees_passes.htm or http://store.usgs.gov/pass/index.html.